Ich bin Noemi Carrau, eine junge Künstlerin, die in Venedig lebt und als Illustratorin arbeitet. Ich biete hier Privatkurse in Zeichnen und Malen an, die ich in Englisch, Italienisch oder Spanisch geben kann, aber leider noch nicht in deutscher Sprache. Do you enjoy drawing and painting? 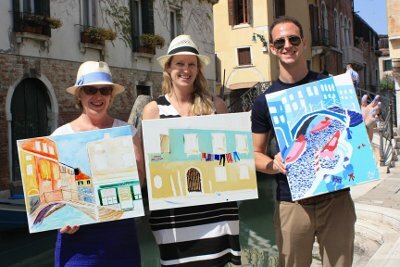 Here, in the heart of Venice, I offer all the year Art courses for children and adults. I also organize individual lessons and workshops for families and small groups. I create a personalized program for each student, according to the personal interests and the previous experience. The lessons are opened to all levels. Beginners are welcome! You will learn how to look into the world in another way by using different techniques. I will guide you in the creative process from the beginning to the end. You can create your own artwork and take it home! If the weather is nice, we can go outside for drawing and painting open air. I believe this is the best way to discover the city. I do it every day and it's a great experience! I will provide all the materials. You just need to bring your creativity!